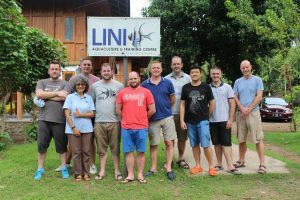 During the last 4 years, our reef restoration program and capacity building program at the LINI Aquaculture and Training Centre at Les village, have received welcome support from our supporters in the UK, the Independent Aquatic Imports and Maidenhead Aquatics partners. During the last visit in November 2017, we received a one-year supply of water quality test kits, which relieved us from the burden of the high costs of purchasing these test kits from overseas. 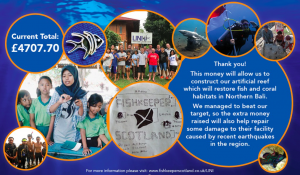 During the visit, Fishkeeper Scotland came up with the idea of fund raising for our reef restoration efforts, to support us in helping to build more reef structures. This week, we got some more wonderful news that they raised £ 4707.70, exceeding the expectations of the budget we need! This is so fortunate, because our ponds were cracked and damaged as a result of a series of recent earthquakes in neighbouring Lombok island, we urgently needed funding to repair them. We believe that these collaborative efforts to save the reefs and support reef conservation programs in Indonesia, (from where the industry is sourcing many of the fish for its stores), will go a long way to maintaining the sustainability of the trade. Cooperation will benefit everyone along the trade chains in the marine ornamental trade, from the fish collectors to the end buyers. 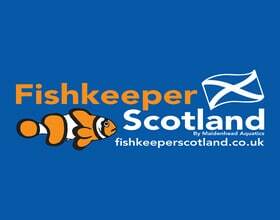 We are grateful to receive continuous support from Fishkeeper Scotland, Maidenhead Aquatics and their supporters, the Independent Aquatic Imports in the UK and Bali Double C in Bali. Thank you all once again!